The Other Part of the Galaxy: Jacen Solo's Quotes! Jacen: "Thanks for saving my life." Corran: "Sure, now don't ever disobey another order." Jacen: "But I saved your life." Jacen: "I was out of control—"
Vergere: "You were not. Don't make excuses." Vergere: "Out of control is just code for 'I don't want to admit I'm the kind of person who would do such things.' It's a lie." Anakin: the force is one, jacen. it encompasses all opposites. truth and lies, life and death, new republic and yuuzhan vong. light and dark and good and evil. they're all each other, because each thing and everything is the same thing. the force is one. Anakin: yes. and it's the truth. Jacen: "You're not Anakin! You're not! Anakin would never talk like that! Anakin would never believe that! You're just a hallucination!" 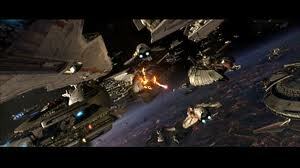 Jacen: "Hey, Jaina – you know why TIE fighters scream in space?" Jaina: "Sure, their twin ion engines set up a shock front from the exhaust—"
Jacen: "No! Because they miss their mothership!" Jacen: "The Force is too big." Tenel Ka: "And this is what you learned in the five years you were gone?" Jacen: "The core of it, yes." Tenel Ka: "It took five years to learn that?" Jacen: "There was a lot of travel time." AWESOME QUOTES FROM JACEN SOLO!! !